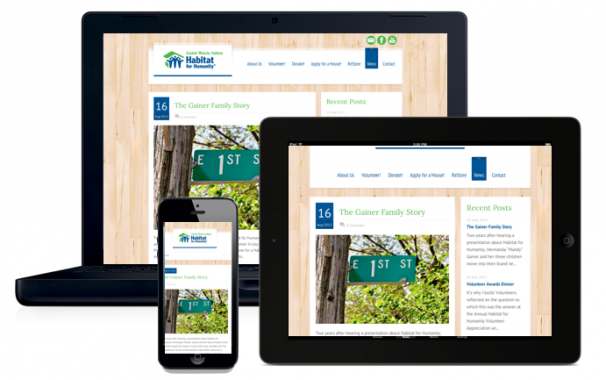 Oct. 9th, 2013 – Muncie, IN – Greater Muncie Habitat for Humanity recently announced the launch of their newly refreshed and redesigned website (munciehabitat.org). 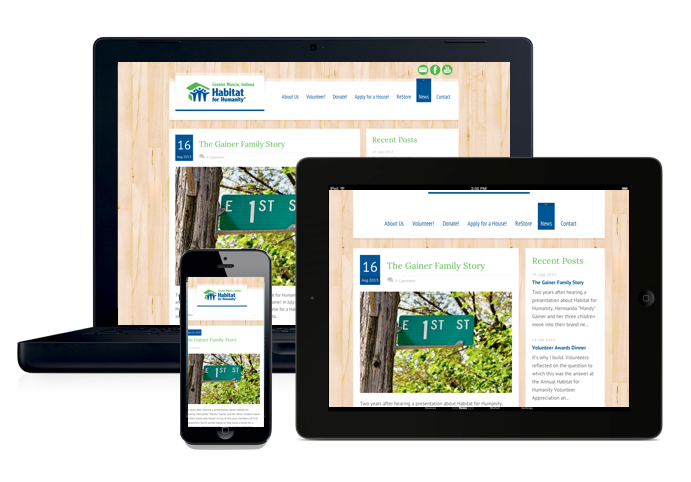 Updates include an attractive new look that is consistent with the Habitat for Humanity brand, additional photography, and a content management system to allow for easy updating of content. The Greater Muncie Habitat for Humanity website more easily allows viewers to access the three most highly trafficked sections of the site including; Volunteering, Applying for a House, and the Habitat ReStore. This design will allow volunteers to engage with the organization, individuals to find out more information about the organization and the housing application process, and provide details about the ReStore. Lastly, the website was created to be responsive in design, meaning it can reformat for desktop, tablet, or mobile devices so viewers can view optimized content across all platforms. “We want our audience to see the difference Habitat for Humanity can make in people’s lives,” stated Lindsey Arthur, Greater Muncie Habitat for Humanity CEO. The site was built by Whitinger Strategic Services, a Muncie-based business development firm. Habitat for Humanity is a non-profit, Christian housing ministry that believes that every man, woman, and child should have a decent, safe, and affordable place to live. The organization builds and repairs homes all over the world using volunteer labor and donations. Partner families purchase these houses through no-profit, no-interest mortgage loans or innovative financing methods. Homeowners invest hundreds of hours of their own labor into the building of their Habitat house and the houses of others. Habitat’s principles include demonstrating the love of Jesus Christ, focusing on shelter, advocating for affordable housing, promoting dignity and hope, and supporting sustainable and transformational developments.